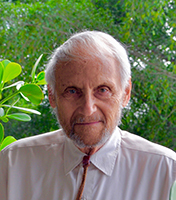 WYN is the pseudonym for Irwin Shishko, an “old scribe” who has penned countless words as a Wall Street economist, medical research commentator, political analyst, and author of poems and plays. A Florida resident, WYN and his wife, Renee have just celebrated their 68th anniversary, still inspired by friends, music, and ballroom dance. Three Fascinating History Plays. If you are a theater aficionado, you know how unusual it is to encounter plays which illuminate key figures in American history. That’s one reason for the huge appeal of the Hip-Hop Hamilton musical on Broadway. Outside that musical genre, this trilogy of “Great Americans on Stage” is a sterling addition to the repertoire of fine drama-works about our early heroes. 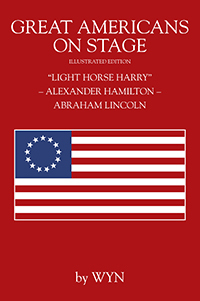 It offers exciting, intimate, and revealing portraits of three great Americans: “Light Horse Harry” Lee, Alexander Hamilton, and Abraham Lincoln. Two of these dramas – the Light Horse Harry and Alexander Hamilton plays – lean towards realistic story-telling, though most of the sparkling dialogue had to be invented. By contrast, the Lincoln play is built around an imaginary encounter between a young Quaker “war-resister” and the President-elect en route to his inauguration, and crucial decisions on the eve of the Civil War. Whether founded mainly on actual history, or on the author’s imaginative theatrical concept, all of these plays are rich in insight about their lead characters, and the events of the period in which these eminent men are so vitally involved. We’ve probably said enough to suggest the beguiling character of this all-American play collection – a trilogy you are apt to find as edifying as it is entertaining.